Locks have existed since the dawn of civilization. Security has evolved as society has spread, and with the changes in security, locks themselves have changed. 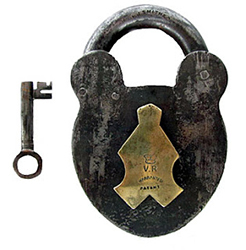 One of the most revelatory changes was the invention of the padlock. At the root of this device is the idea that a lock can be added to something and also removed. It is a detachable lock that fastens and secures with the use of a shackle. The shackle can be a hinged or slide with the assistance of a spring, but it is the fact that once open it can be removed that makes it a padlock. Regardless of the method or key used to open it, a padlock remains a padlock. Where does it come from? What does the word mean? Let us explore the long lineage of the padlock: a lock that although impermanent has sustained the test of time. The etymology of the word is at this point still unknown. Some theories include that the prefix pad may, in fact, mean gate, which would suggest, perhaps, that these locks were predominantly used (or originally designed) for locking a gate. Pad could also mean, to walk on foot. That could stem from the use of a gate that would lead to a path, or just a lock that was meant to guard a path. Pad in the United Kingdom is synonymous with, pannier, which is a basket most often used with animals (saddlebags). With the origin of padlocks and their usage in ancient societies, perhaps the lock on the bags of merchants, who would store their goods in baskets fixed to their animals might make the most sense. But the use of locks by royalty as well as farmers might also make a strong case for the guarding of a gate or path. Another theory is that the name was coined by Vikings from an English settlement in York. It is thought that these tribes would use the lock to keep livestock cages secure, which are also known as paddocks. The name padlock might come from the evolution of this region as paddock is very similar to the word padlock. Shackle – This part of the lock is most often shaped like a “U”. When the lock is disengaged the shackle will be free moving, either on a hinge or a slide. A hinge will allow the shackle to move between a vertical and horizontal position as one side is hinged and the other is free when the lock is disengaged. With a slide, when the lock is open it will extend the shackle out of the lock’s body on one side, and the shorter side will expose an opening so the lock can be removed. 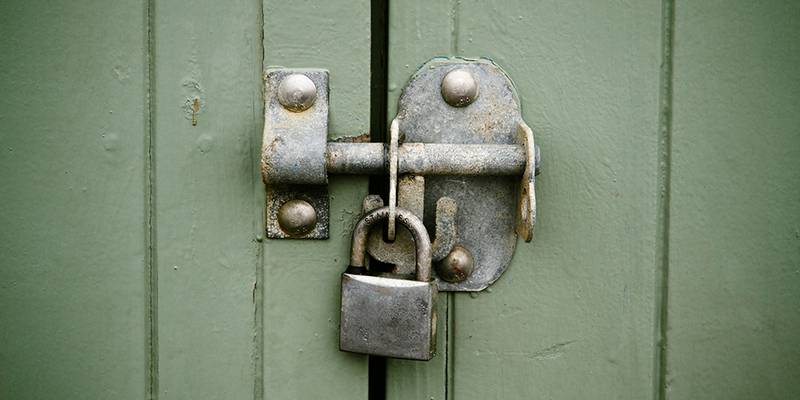 Body – The body of the padlock holds the inner workings in place. When the lock is in its locked position it will house both sides of the shackle, and release one side when opened. The body will also house whatever components open the lock. This may be a key cylinder or a combination dial. With a key cylinder, the lock will need to be opened (releasing the shackle) by turning a key in the keyway. A combination lock will only require that the correct code is entered into the device. Locking Mechanism – The two forms of locking mechanisms are modular and integrated. The modular is the most recent version. The key will retract the “locking dogs” (most often ball bearings), which are the pieces of metal that will catch on the cuts that are on the shackle. All of these parts work together but are connected in a way that allows the lock to be disassembled. These features allow the padlock to be self-locking so that it can lock without the key or combination being reinserted. An integrated mechanism means that the lock is directly manipulated by the use of the key. As a result, these locks can not be taken apart. If the integrated padlock is disassembled then it will have been broken because the lock will have been separated from the mechanism. 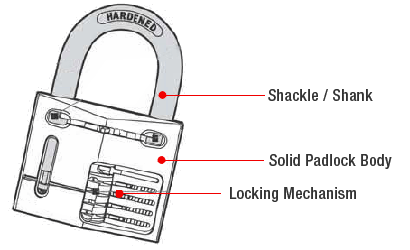 Most often an integrated locking mechanism will need a key to relock the padlock. 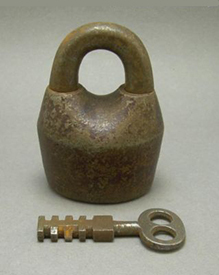 The oldest known padlocks date back to 500 years before the common era (BCE), and hail from the Roman empire. One of these ancient versions had a rounded iron plate body that was approximately one and a half inches (about four centimeters) by two and a half inches (about 6 centimeters). The body holds a bolt that is manipulated with the use of a key. 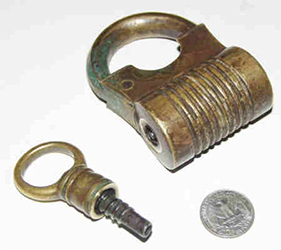 Instead of a shackle the lock used a chain that would link to the body on one side and fasten by retracting the bolt into the last link in the chain’s other end. 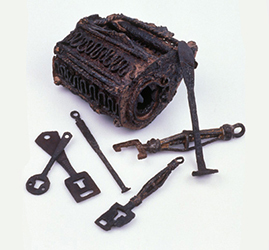 The more common Roman padlock that you will see is a two-part lock with a rectangular body that has an attached metal pole and a separate shackle with a ward spring. A ward spring is a piece of flexible metal that that is shaped like a “V”. The shackle is placed in the body and the spring closes as it is fit in the hole. By pinching both sides of the “V” together, the shackle can move freely. Once the shackle is in the lock body, pulling on the shackle will have the ward spring widen and keep the device locked. At the bottom of the body, the key can be inserted, and that will pinch the “V”, and open the lock. The key is a flat rectangular piece of metal shaped with a 90-degree bend. On the small end, there is a hole, and that hole will fit around the spring. The trade routes between Asia were able to spread the access to these locks, as they were used very often by merchants. 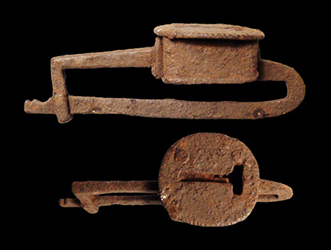 By 25 AD, China was using these locks widely throughout the empire. The Chinese padlocks were most often made of bronze, compared to their ironed plated Roman counterparts. Many centuries and quite a distance away, in modern day York, England, the Viking settlement of Jorvik would also have padlocks. According to dating by archeologists of these artifacts, these devices would have been made anywhere from 850 to 1000 AD. As stated in the meaning section, this might be the area that created the term padlock, as the tribesmen would use the locks to secure their paddocks. Taking a look at the Viking padlock you can see the similarities to its Roman predecessor. The most significant difference being that the key does not have an “L” bend but is instead flat. Padlocks changed as they became prevalent in England. Smokehouses rose in popularity as they were a means of preserving food. But the structure was under constant threat of theft by animals and humans alike. The answer would simply be called the smokehouse padlock. These wrought iron padlocks were made with warded keyways so that notches on the key would have to fit the specific obstructions in the keyway. A hole in the key would fit in a protrusion on the inside of the lock, which would provide a swivel point for the key to line up with the warding. These locks had many security flaws, including susceptibility to forced entry, and no way to detect if they had been secretly picked. In the Slavic regions of Europe (Russia, Serbia, Poland, Czechoslovakia, Slovenia, etc.) 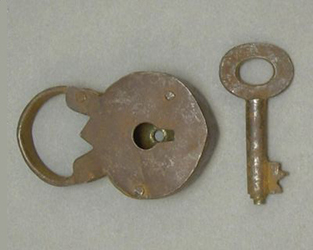 the competing padlock for the smokehouse padlock was the screw key padlock. The screw key would function much like you would expect. Instead of a simple turn, you would have to rotate the key, threading it into the lock (similar to a barrel lock pick). Once the key had been sufficiently screwed the key would be pulled out (without counter-rotating). This would extend a spring within the lock, which would retract the lock’s bolt. But both of these padlocks saw the end of their popularity by the 1910s when key variation made the screw key obsolete, and mass production decreased the sales of warded locks. The road up to obsolescence was paved in the 1800s when Swedish inventor Christopher Polhem created what would be known to history as the Scandinavian padlock. The lock body was composed of cast iron, and the locking mechanism for these padlocks focused around rotating disks. The disks need to be rotated, and that was done with grooves on the disks that correspond to a specific key. There were also grooves on the outside of the disks, which would need to be lined up so that the shackle could be released. This technology was patented in 1871 and was continuously manufactured by the patent holders until the 1950s, adding up to almost a century of production. Just as the smokehouse had the screw key, so too did the Scandinavian padlock have the cast heart padlock. The cast heart was cast in bronze or brass, which made it very strong, as well as more resistant to weathering than the Scandinavian padlock. The term “heart” is derived from its shape, which loosely resembles a heart (the valentine’s day heart, not the anatomy heart). The cast heart would also have a drop, which was a cover for the keyway that would keep dirt and bugs from compromising the lock. It was also designed for being carried and had a metal loop so a chain could be placed to secure the lock to your person. These locks could be mass produced, which lowered their cost and increased their popularity. They were also a favorite among industrial businesses and railroads because the drop kept moisture and grime from eroding or filling the lock, and the cast heart could function in icy climates. Some might even say that these padlocks contributed in some small part to the popularity of love locks. In the 1870s, the cast heart was duplicated with cheaper materials and the price was lowered once again. The quality of the product had dipped significantly with the use of fastened together metal sheets, instead of a solid cast metal body. By the early 20th century, businesses had moved from the far more secure cast heart to the stamped and riveted cheaper imitation. 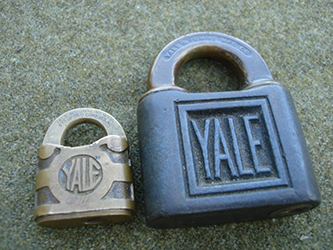 And while this was happening Yale was creating the first modular padlock (up until this point all padlocks had used integrated locking mechanisms). These new modular locking mechanics allowed the locks to be serviced and rekeyed because all components could be removed and reconstructed. This was, however, almost two decades before Yale would create the pin and tumbler cartridge that would change the face of security. 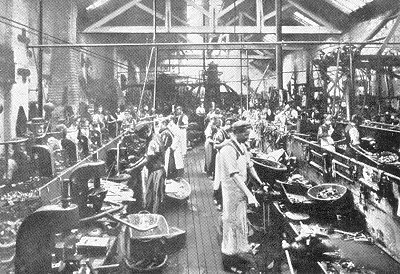 By the start of the 1900s the machining process was beginning to be more financially feasible, as the accessibility of electricity was becoming more widespread. This was a huge shift in the lock making process. It was now cheaper to make solid metal locks, and the riveted padlock began to fade into the annals of history. And with machining the use of the modular locking mechanisms could be easily continued. In addition machining also made it possible to shroud the shackle (a body extension that leaves less of the shackle exposed when the padlock is locked) and add an yet another layer of security. 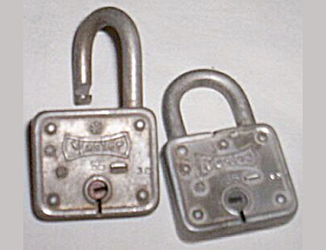 Then in the 20s the Master Lock company released their padlock and the playing field started to take its current shape. These padlocks were not machined but were instead a return to form for the punched and riveted assembly process, with the addition of a laminated plate that increased impact resistance. And finally in the 1930s die casting made it simple and cheap for molten metal to be cast in a mold. This introduced more ornate and decorative locks onto the market, but the process had major security defects. Because making locks this way compromised security so greatly die cast padlocks have almost entirely disappeared from the marketplace. Padlocks have had a long existence and survived the ever-changing cultural landscape. You can still see them everywhere you go even today. But not every padlock you interact with is physical. 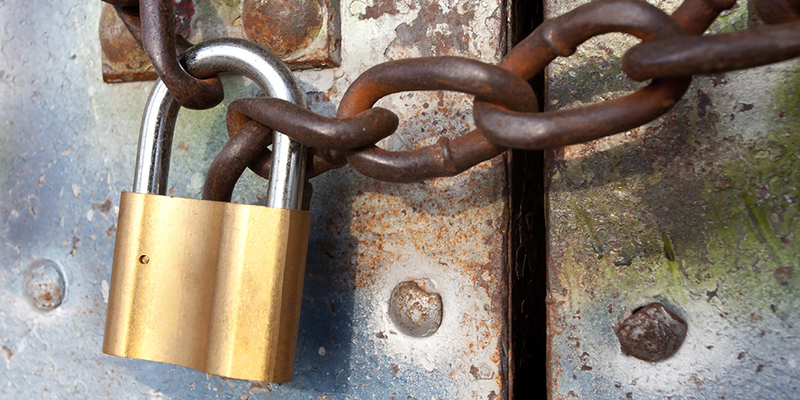 In the current age, padlocks have become a symbol of security. The image of a padlock is used perhaps more frequently than a physical lock. Look on almost any web page, and right next to the URL there is likely to be a padlock. The security of a digital padlock is not something that locksmiths deal with, but it is interesting to see how the idea of security is still synonymous with padlocks. It is unclear what the next iteration of security will be, but it does seem that the padlock might never disappear from the world’s collective conscious. Whether it is in theory or in practice, the padlock seems as if it is here to stay.